Read the comments made by previous participants. For this year’s theme we chose to honour a male Orixa. Omolu is sickness and health, diseases and the protector of diseases. He is the Sun, the harvest, Lord of the Earth, King of the ancestors who guides the soul after death. Obaluaie is the young aspect and he is a warrior and a hunter. The older aspect, Omolu, is a sage, a magician and a guardian. Omolu comes from the Ewe/Fon tradition and, due to his importance, he has been incorporated into the Yoruba traditions of Candomble (Brazil) and Santeria (Cuba) as well as many other nations. In Brazil, the Ewe/Fon tradition that is practised today is known as Jeje and in Cuba it is called Arara. 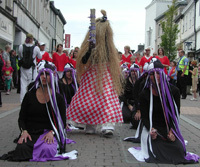 Mintfest is a colourful and spectacular event held in the picturesque town of Kendal in the Lake District. There are street artists from all over the world and Edun Ara was delighted to be part of these festivities. We had 65 participants comprising of 10 singers, 15 dancers and 40 drummers. There were some regulars and many others who were taking part in our project for the first time. 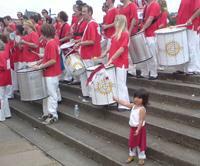 We also had a number of children join the drumming section making it possible for some to participate as a family. The singers, lead by Vicky Jassey, sang a number of songs from different Afrobrazilian and Afrocuban traditions. Our performance piece began with everyone singing acapella with the lead vocals sung by all the singers and the chorus comprising of the dancers & drummers. Magliari, reflects many of the main qualities and attributes associated with Omolu. The sequence begins with Omolu rising from the Earth and ends with him returning to the Earth. In between, there are dance movements that draw attention to; his role as a King, the pain he suffers from his illnesses, his warrior status and his cleansing of the air around him. In Cuba, Babalu Aye’s colours are purple and black and in Brazil Omolu commonly wears black and white with a little red. He is also often covered in raffia. The dancers costume includes all these colours and the strands that run down from the head take the place of the raffia. The drummers, led by Ravin ‘Raz’ Jayasuriya, represent Xango (Brazil) and Chango (Cuba) who, as well as having many other aspects, is the Yoruba Lord of drumming. His colours are red & white and his symbol is a double-headed axe. The percussion composition mixes elements from several Afrobrazilian and Afrocuban traditional music styles and draws on rhythmical themes from the drumming in Candomble de Ketu, Santeria and Arara. Everyone worked and concentrated extremely hard all weekend and the end product was performed with a lot of grace, power and presence. Our closing performance in the beautiful setting of the Brewery Arts Centre was truly memorable. Our theme for this year was the Yoruba Goddess Yemayá. In Africa she’s a river Goddess and in Cuba & Brazil she represents the ocean as well as the essence of motherhood and a protector of children. 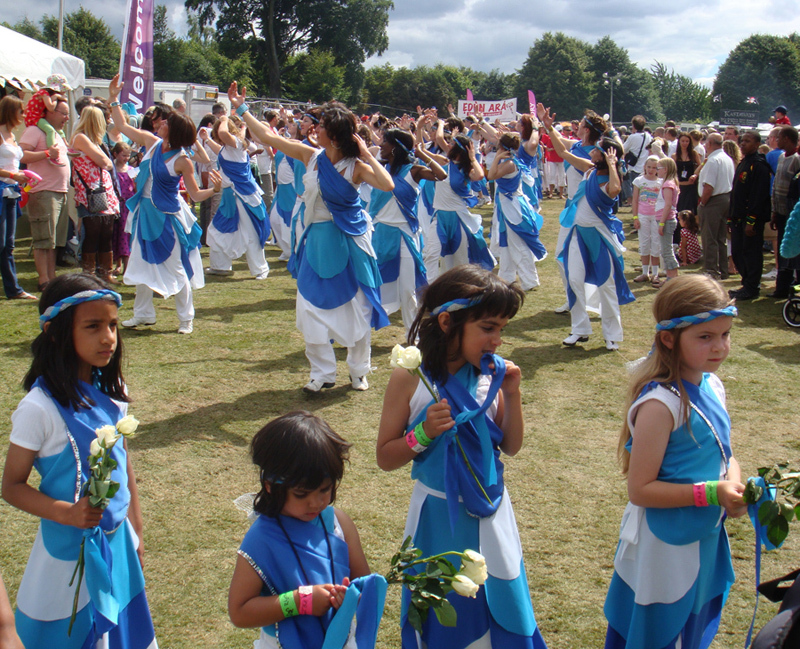 Participant numbers increased dramatically from 2007 with 80 drummers and 46 dancers taking part this year. There were lots of regulars and lots more new people attending for the first time. For this year’s project, the design of the dance costume reflected the flow of the sea with two shades of blue and the colour white. Yemaya wears a silver crown (she doesn’t wear gold) and this silver colour was included in the headband worn by the dancers. Movements in the choreography represented both the calmness and the stormier aspects of the sea. 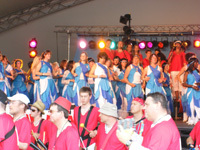 The drummers wore their customary red shirts and white trousers. This red and white combination represent Chango, the Yoruba God of Thunder. Chango is a warrior king with many aspects including lightning and justice and he is Lord of the drums. His symbol is the double-headed axe and a version in white material is sewn onto the back of the drummers shirts. The drumming, played on Brazilian carnival percussion instruments, is a fusion of rhythmical elements drawn from Afrocuban and Afrobrazilian traditional music played for Yemaya. Once again we added songs from the Afrobrazilian tradition of Candomble & the Afrocuban tradition of Santeria. A group of around 10 students formed a chorus with the singing being led by London based percussionist and singer, Vicky Jassey. Everyone gave all their energy for the entire parade and the two static performances. There was quite a distance from the the leading dancers to the final drummers at the back. The bloco kept together really well and was a sight to behold. The stage performance was spectacular with the singers on stage stood on a riser, the dancers on the stage in front of them and the drummers on the ground below. The three levels of percussion, dance and song created a wonderful image and produced a fantastic sound. This year we presented a piece for the Yoruba Goddess Oya (Iansa) - her aspects include the warrior-goddess of wind, lightning, fertility, fire and magic. The number of participants almost trebled from 2006. We had 60 drummers and 25 dancers taking part. There were lots of new people this year as well as many who attended last year returning for more. The design of the dance costume reflected the flow of the wind combined with sharply cut edges that represented lightning. The choreography itself represented three of Oya's well known aspects wind, lightning and warrior. There are many colours associated with Oya but she is often represented by one of them a maroon/wine red which was the main colour for the dance costume this year. The drummers wore red shirts and white trousers. This red and white combination represent Chango, the Yoruba God of Thunder. Chango is a warrior king with many aspects including lightning and justice and he is Lord of the drums. His symbol is the double-headed axe and a version in white material is sewn onto the back of the drummers shirts. We also added songs from the Afrobrazilian tradition of Candomblé & the Afrocuban tradition of Santeria. Everyone gave all their energy for the entire parade and the two static performances. 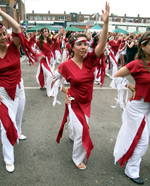 As the bloco was winding along the streets of Hitchin town center, crowds gathered to cheer and marvel at the spectacle. Samba and Community percussion groups and also to individuals who love to learn exciting original arrangements. 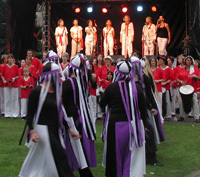 As well as learning rhythms, people work on dynamics and playing techniques and increase their awareness of the interplay between the instruments. There were separate drumming and dance rehearsals with a couple of combined sessions over the weekend. Study sessions were structured to give participants plenty of free time to enjoy the wonderful ROTW festival. Drummers and dancers worked extremely hard to prepare for parading the project on Sunday afternoon. The parade lasted about two hours and there were lots of smiles all round from the observing public, ROTW representatives, as well as from all those parading. The parade route went right round the centre of Hitchin so thousands of people were able to see the spectacle. The vibrant and solid beats from the drummers moved the dancers graciously forwards defying the heat and together we produced a wonderful energy. We definitely brought the contagious energy of the Brazilian Carnival to the Rhythms of the World festival: music, dance, colour, all together as ONE. come true! It could not have been better or more harmonious from the beginning to the end.